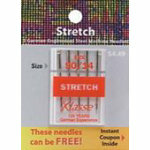 KLASSE-5 German-engineered steel machine stretch needles. Size 90/14. The stretch needle has a specially designed needle tip and scarf to prevent skipped stitches in knit fabric. Best for: 2 way stretch knits, lycra, power net, silk jersey, spandex, and highly elasticized synthetic fabrics. Also ideal for elastic. Use with polyester or cotton wrapped polyester theads. For extra stretch use woolly nylon.